Back in October I posted a layout of ORU 'girls' together in Ohio for several days. 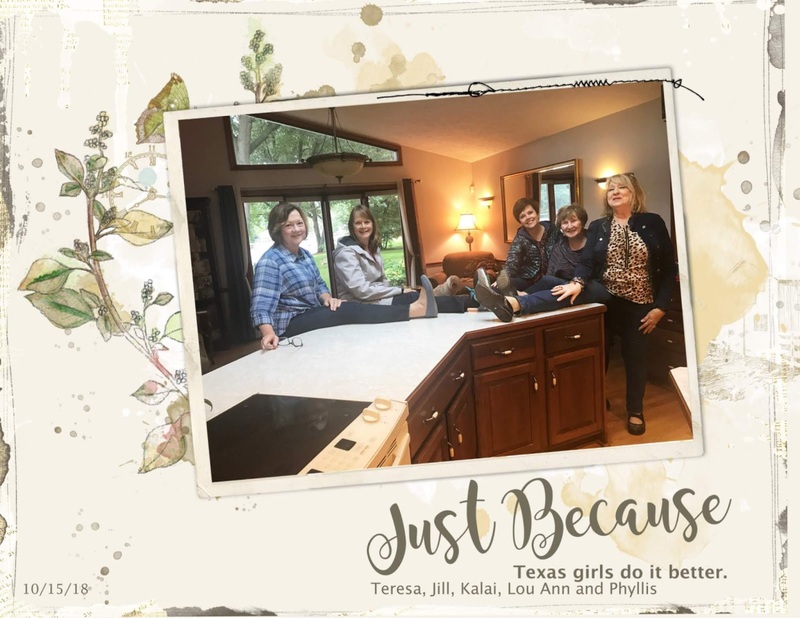 Our Texas cohorts had come to enjoy some fall days with us. We had a wonderful let your hair down time together..
Tonight I'm posting one page from October 12 and one from October 15. Eventually, I may have layouts to represent all the activities for that week. 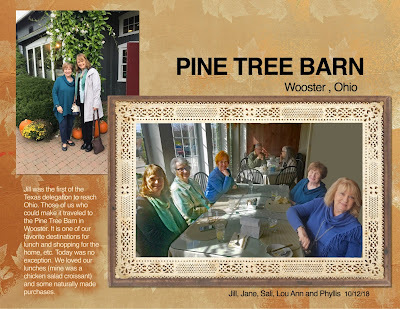 These are two of several pictures that were taken at Pine Tree Barn. Jill was the first to arrive from Texas. We didn't waste any time, those of us who could take off and go to Wooster for lunch jumped at the chance. The bottom layout is just silly. We had to show our youth by doing something silly at my house with only one witness...my husband Ron, the camera man. Not everyone my age for sure can throw her leg up on the kitchen counter. I'm saying that, though I've never actually seen anyone else do it besides me when I challenged my teenage granddaughter at Christmas. Oh yes, she could do it as well. I really have to confess that not all these ladies are as old as I am. I am the oldest with the youngest one here at least 15 years younger. I feel I must explain the comment about Texas girls. All of us in the bottom picture either live there at present or used to live there (one was born and raised there) or in my case have Texas roots. My dad was a Texan before he married my mother. I was a first grade school teacher for several years before retiring to have a family. My husband and I raised 6 children, four were his and two ours. From '67 to '98, I had children at home. Loved them so much. They were my life. But now that I'm a grandmother and 'retired', I'm pretty much doing what I want. I have been an artist in oils and colored pencil. Now I'm in to digital scrapbooking big time. Besides that, I love Bible study. I belong to the most wonderful group in the world. ORU (Opinions R Us). Among the 9 of us 'girls',are opinions enough to run the world. We travel together,e-mail,'party' and all talk at the same time. I cherish their friendship. And my husband loves them all.